We took a day trip to Madison County to check out the six covered bridges, Pammel Park, the house John Wayne was born in and the countryside. The only problem was the camera battery gave out just after we took one picture of bridge number five. So we didn't get any pictures of the Hogback bridge, but I found some pictures on the internet and have used them. There were 19 covered bridges in Madison County at one time. Six remain, and all are listed with the National Register of Historic Places. They were covered to protect the floors from the weather. A Bridge without the cover would last 10-15 years and with a cover they are still going strong. There are four bridges with steep roofs and two with flat roofs. Most of the bridges were built by local farmers who traded their labor to pay off the poll taxes. They were named for the nearest residents. Most of the existing bridges were built between 1855 and 1885 at an average cost of $900 to $1,200. Average reconstruction cost of a bridge has been $140,000.00. Click on any Bridge picture for more information and pictures. The Roseman Covered Bridge was built in 1883 by Benton Jones is 107 feet long. It is known as the haunted bridge. The story goes that Madison County Sheriffs had chased a prisoner inside the bridge, traping him. When they closed in...he was gone. Sometimes at night you can hear moaning. This bridge was made famous by the book and movie, Bridges of Madison County. This bridge sat at the same site since 1883 until 1992 when it was moved to it's present location for $152,515.00 and is the only bridge that has a Souvenir shop on site. We visited the bridges in the summer of 2001 and in 2002 the bridge was destroyed by an arson. a replica was constructed and dedicated on October 9, 2004. The Cutler-Donahue Covered Bridge was built in 1870 by Eli Cox and is 79 feet long. 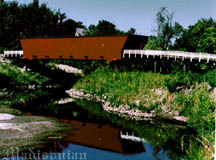 This bridge was moved 18 miles into the the Winterset City Park in 1970 from it's original location crossing the North River near Bevington. Built in 1880, bypassed in 1987, the Holliwell Covered Bridge spans the Middle River a short distance East of Winterset, Iowa. 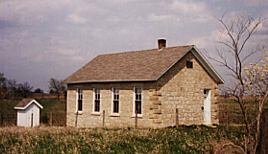 Holliwell was photographed several times in the Warner Brother's movie, " The Bridges of Madison County", starring Meryl Streep and Clint Eastwood. Located in the northeast corner of Madison County, this farm home had been abandoned for over 35 years. 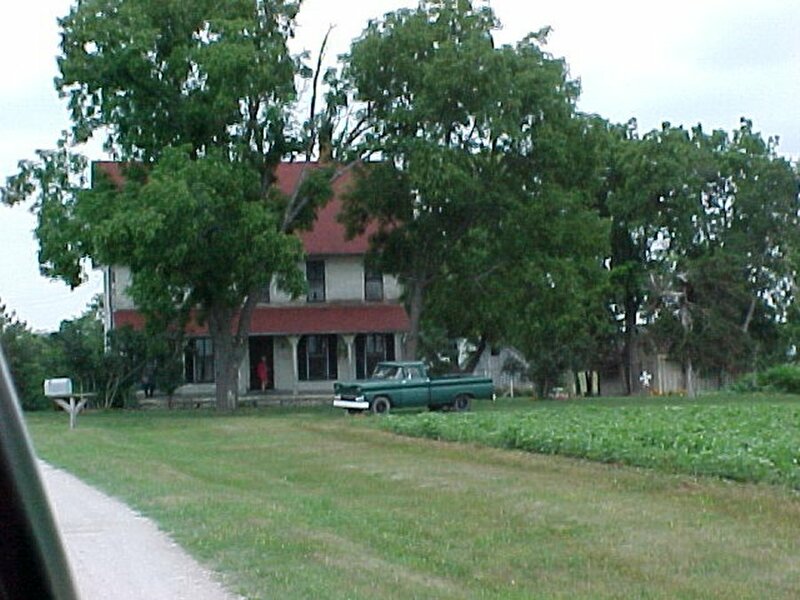 Production scouts for the the movie Bridges of Madison County searched for months prior to the filming for the 'perfect' site and finally chose this secluded country farmstead where Francesca and Robert would spend most of their limited time together. Fully restored for the film, the home's exterior and interior remain exactly the same as they were for the shooting of the movie and is open to the public for guided tours throughout the summer months for a fee. Situated in Winterset City Park (along with the Cutler-Donahoe Bridge), Clark's Tower was erected in 1926 as a memorial to one on the county's first pioneer families by their descendants. Constructed of native limestone, it stands 25 feet high and offers a commanding view of the Middle River valley below. 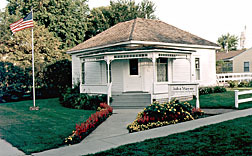 Film star John Wayne was born in Winterset, Iowa, and the home in which it happened is on display. The simple wood frame, 4-room house is where the Hollywood legend entered the world as Marion Morrison on May 26, 1907 in the only bedroom of a house that still stands on 2nd Street in Winterset. He was 13 pounds when he greeted the world, and given the size of that bedroom, he probably filled it. He lived here for three years. The house has been restored and maintained as it would have looked in 1907. John Wayne has been dead since 1979. Stomach cancer got him after lung cancer didn't. His last movie, "The Shootist," came out three years earlier, in 1976 -- and yet ... In January, a Harris poll ranked him third -- trailing only Denzel Washington and Tom Hanks -- as America's favorite movie star. Among those age 42-60, he was No. 1. Pictures in the town of Winterset. Including County Courthouse, and other interesting places.